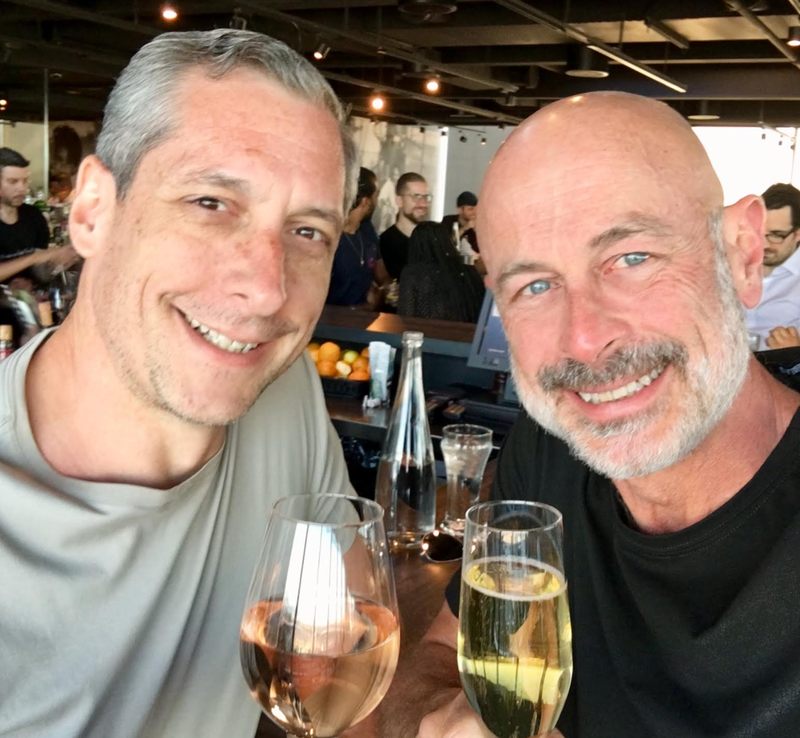 Sergio and I recently returned from spending several days earlier this month on vacation in Montreal. 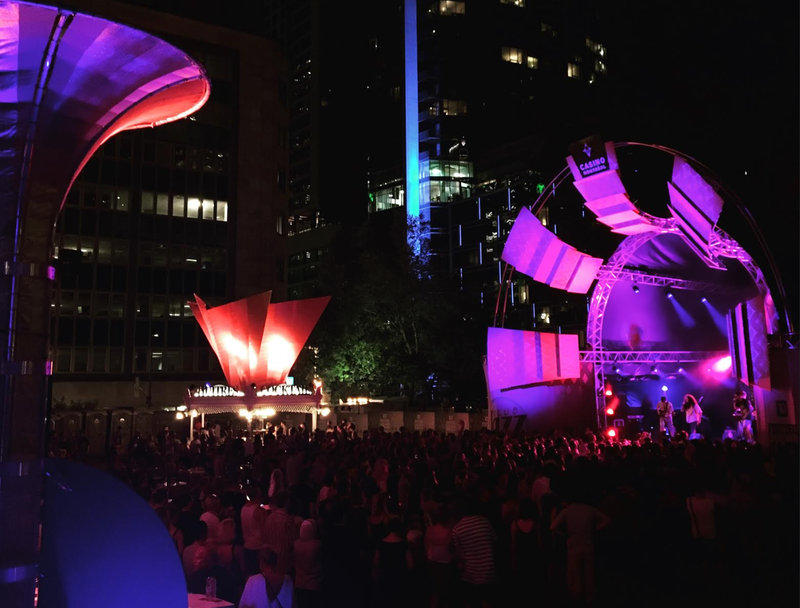 Our stay happened to coincide with Montreal’s annual Jazzfest, which is absolutely massive and happens to include a few hundred free outdoor performances in downtown Montreal. This was the first trip back to Montreal in about 10 years and our first trip ever in the summer. 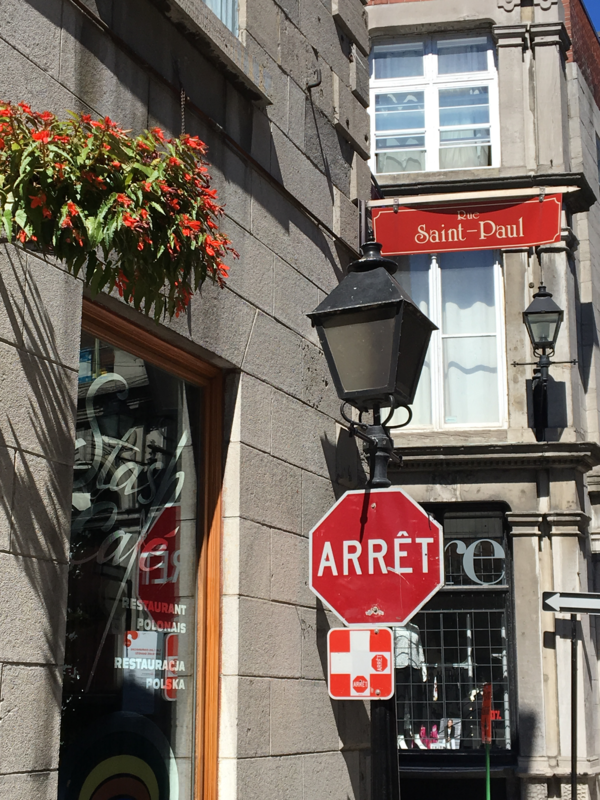 While we initially were looking at AirBnB’s in the Gay Village, we ultimately booked our stay at the Westin Montreal, which is just two blocks from the Notre Dame Basilica and a five minute walk to Old Town. We divided our time between Old Town, The Plateau and the Gay Village. 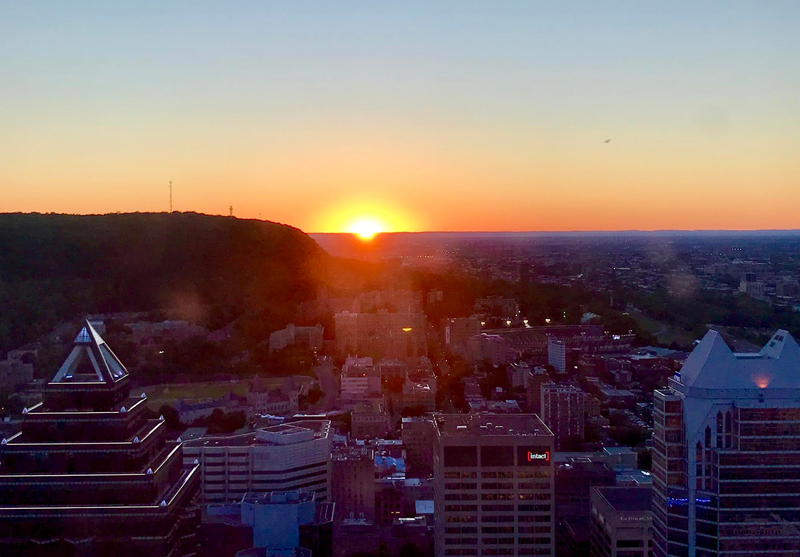 Below are some suggestions and observations, which I’m writing down as much to help others who may want to plan a trip as much as it is to help me remember what we did and where we went, because we will definitely return to Montreal in the summer. 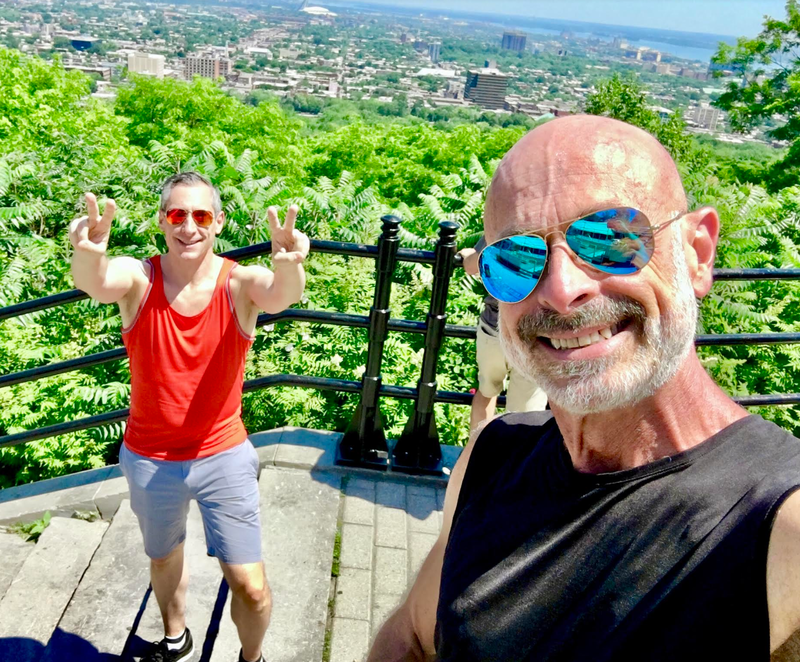 HIKING: While there are a lot of things to do in Montreal, we decided to be outside as much as possible so despite a record breaking heatwave, we stayed (kind of) cool by spending an entire afternoon hiking around The Mount Royal Park. The park was designed by Olmsted and is an easy hike to the the summit, which affords you some great views of the city. 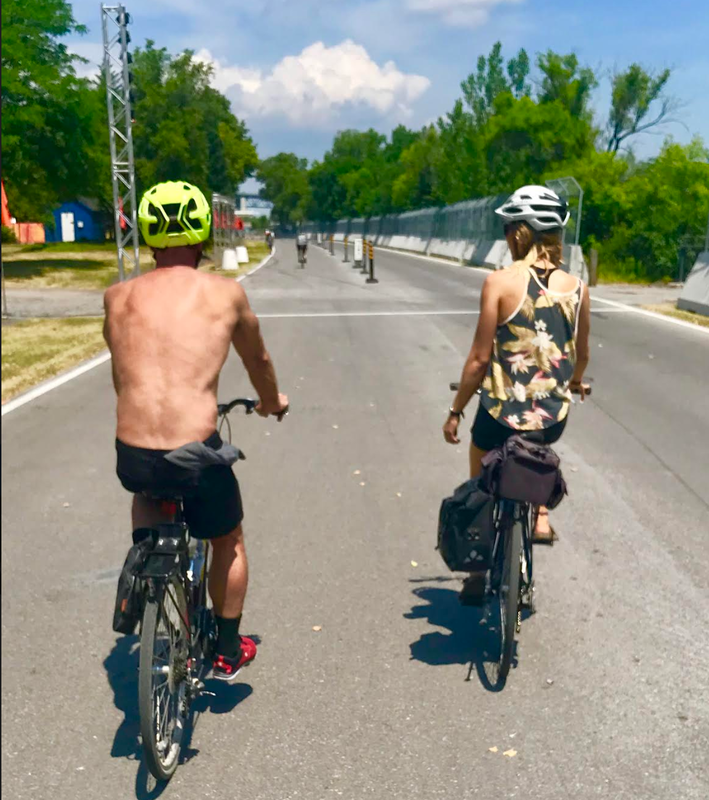 BIKE TOUR: We spent half a day riding approximately 10+ miles around old town, the canal, Pointe-Saint-Charles and the two islands, Ile Notre Dame and Ile Sainte Helene. The photo above is of Sergio and our tour guide riding on a portion of Montreal’s Formula 1 race track. While there are a lot of bike tour companies, I selected Ça Roule Montréal because of the price, convenient location and they allow you to keep the bike for the rest of the day if you want to continue to explore Montreal by bike. This was more fun than we bargained for and gave us a much better appreciation for the city. JAZZFEST: is the largest festival of its kind and set a record attendance of 2 million spectators several years back. There are several large stages set up in the downtown with musical acts starting early and playing until Midnight (or there about). It is easy to walk from one outdoor stage to another and there are plenty of interactive sections as well as food and drink to keep you happy. We really enjoyed the festival and returned to it if only briefly nearly every evening. Next year’s festival will run from Friday, June 28 to Saturday, July 6, 2019. 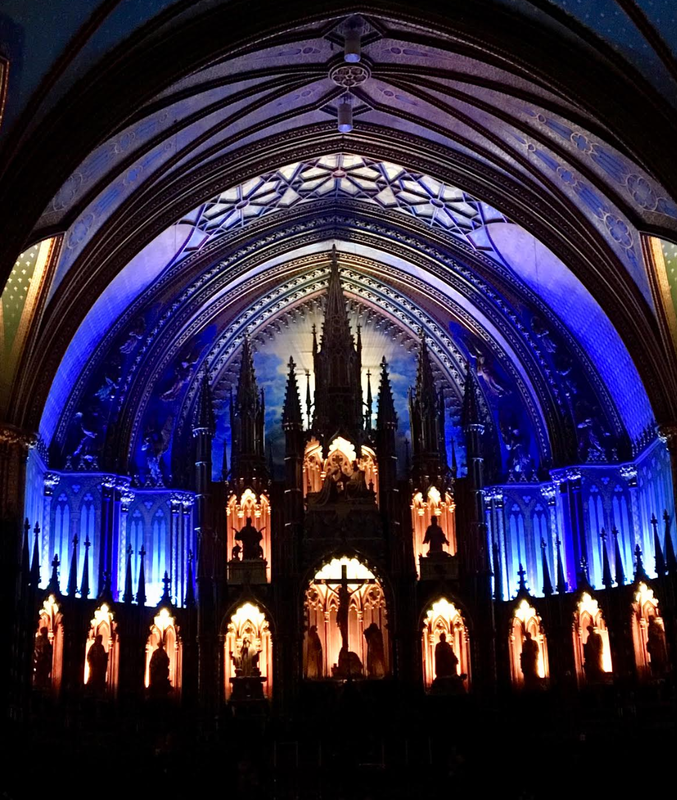 NOTRE DAME: For approximately $25 you can purchase tickets to the lighting show, AURA, inside Montreal’s most beautiful church, Notre Dame. The show was a surprise for Sergio. We really enjoyed ourselves, and I would recommend it to anyone planning a visit. You can see the show online but it doesn’t do it justice. Here is a video of one scene from the show. After the show you can walk across the square to Brasserie 701 for a drink or for dinner if you’re hungry. NEIGHBORHOOD STROLLS: We divided our time fairly evenly between Old Town, The Plateau and the Gay Village. 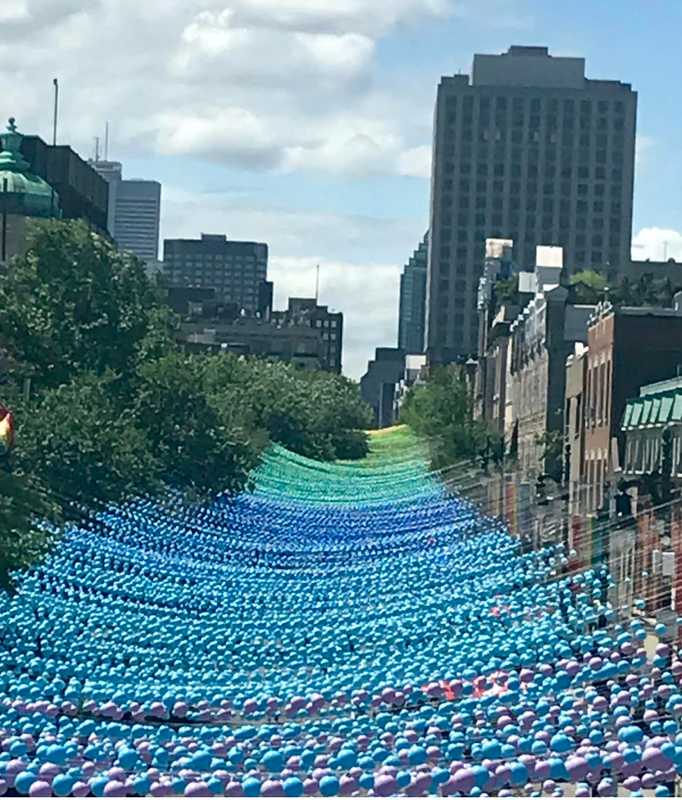 Shown above is an interesting view of the colored balls strung across Rue Sainte-Catherine in the Gay Village to create a rainbow that runs for about a mile and provides an interesting view when you can get above these colorful strings to see the full impact. Each neighborhood has its own vibe. Old Town is charming and has great places to eat, drink or grab a snack. It is also ground-zero for all tourists so take that into account when you visit. We were pleasantly surprised to find that in the evening the city projected interactive lighting displays and avant-garde videos on many large buildings in Old Town. It added a lot of visual interest, while helping to brighten dark alleys and corners in such a creative way that it only added to the charm of evening strolls through the neighborhood. 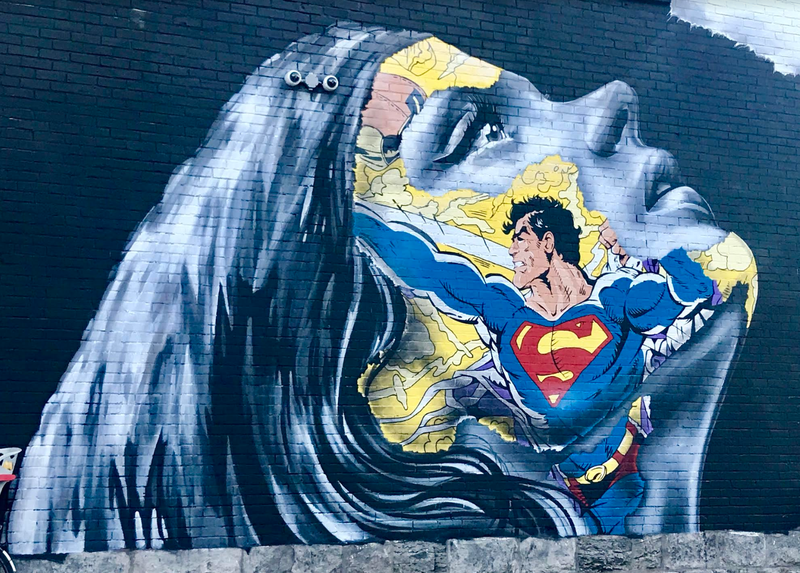 The Plateau is a vibrant neighborhood, featuring some of the most engaging street art and wall graffiti you will see. It is worth visiting for a drink or dinner and an evening stroll. The neighborhood has many affordable, casual dining options that line the streets filled with far fewer tourists and dominated by the 20 and 30-somethings who like to live here near Mount Royal. Below I’ve listed some of the restaurants Sergio and I enjoyed while visiting Montreal and which I would feel comfortable recommending to others who are planning a trip to the city. Brasserie 701, which is steps from Notre Dame, was a place we visited twice in part because of the handsome and friendly bar tender who consistently poured a generous glass of wine. The restaurant is a cool and comfortable space with good food and friendly atmosphere. I wouldn’t cross town to try Brasserie 701 but if you are in the neighborhood and want a drink or bite this is nice place to try. Le Cartet was a last minute recommendation from our concierge for brunch. This place was a total surprise and will be a place we revisit when we return to Montreal. The restaurant is located in Old Town – and was a short walk for us, but I would cross town in the winter to eat here again. Les Enfants Terribles this restaurant in downtown has the best view in the city for dining. Located 44-stories above ground, the dining room and bar are lively and was filled with a fun crowd. The space gets very full around dusk as people come to enjoy good food and drink alongside a gorgeous sunset. Maison Christian Faure We were told by our bike tour leader that this pastry shop located in Old Town was the best in town. While I couldn’t get to every patisserie to confirm that endorsement, I can say that Maison Christian Faure was worth the visit, and I’d certainly stop by (if not for a breakfast) then to grab something for a snack. Saloon Bistro & Bar is located in the heart of the Gay Village and while there is no great dining options along Rue Sainte-Catherine, this place provides fairly steady service, good food and large portions. We ate on their outdoor patio overlooking the street which provides ample people-watching opportunities. Have you been to Montreal? Share thoughts you have about places to see / sights to visit and share your comments about places to eat and drink. Café Orange // 4410 Boul. Decarie// is an amazing breakfast/brunch place to eat. Thank you for the tip Lyne.